Dust is universal. There is no escape from dust. I am missing my sewing machine more than my dishwasher. I will never tire of watching my girls play together. The fighting, though, is another matter. I am continually amazed at how imaginative Abbey is. At this very moment, she is cutting up a banana (with a bread and butter knife) and serving it in plastic mugs for her and Zoe to eat. Hong Kong is so clean. I like it. I love staying in my pajamas for as much of the day as possible. I feel like a bad mother as I get so bored when I take the girls to the playground. I yawn constantly and can hardly keep my eyes open. I think I need to learn to crochet, so I won't be so bored at the playground. I need to find our local library here in Hong Kong. We are all a bit sick of reading the same books over and over. I miss Zoe's cloth nappies. I personally don't like using disposables. When we do the big move to HK, I will be bringing the cloth nappies with us. It really is quite difficult writing this post with a 19 month old Zoe climbing all over me. On a final note, I want to wish my gorgeous Grandma a HUGE Happy Birthday for today. How cute is her little note to me in the photo above? I bought her a lovely hand made birdie brooch for her birthday, I hope she likes it. Have you learnt anything this week? Have a lovely day, peeps. 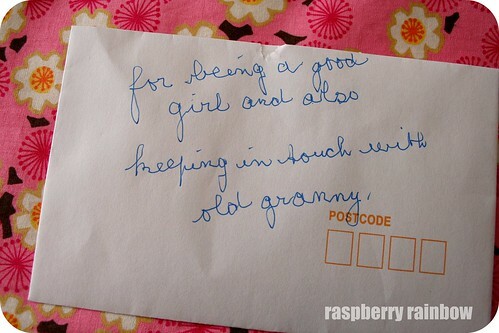 * If you can't read Grandma's old fashioned writing, it says "for being a good girl and also keeping in touch with old granny". Gosh, I love her! awww, that is such a sweet note Cat! love ol' granny writing. i agree with a few things on your list, bored in the playground..yep, need to learn to do something aswell. also loved clothies, loving school holidays and that dust is NEVER going to disappear! Love this post! Love the note from your Granny, I wish mine were around to get notes from :( How beautiful. What a sweet note - her handwriting is *exactly* the same as my nanna's!!! And yes HK is very clean - but there are NO loos in the underground train stations...big problem believe me! My Granny's gone..but she wrote in writing just like that and would say very similar things to me! I wonder where they all get their granny-ness from? This week I've learnt that even when you think you're on top of the washing... there's always another load that needs to be put through. Re.lentless. I love Granny Handwriting. I wish some clever person would make a Granny font. I would use it for sure! What a sweetie yours' is too, Cat!